The townland of Straths is mostly composed of farmland with plenty of rock outcrops and big boulders. The soil is very stony, it must have been river bed once as it resembles the bed of Trawbreaga bay when the tide is out. In the East it borders with the townland of Carndoagh, in the West with the townland of Rashenny and in the North are the shores of Trawbreaga bay. On the Ordnance survey map there is a standing stone marked, near to the dismantled railway. (See fig. 1) It is clearly visible and stands in the middle of a field. I go on photography walks regularly and love to chat with people about beautiful Inishowen. When talking about this stone with one of the residents of Straths, he pointed me to some markings on rocks. This is where my research started because I was fascinated by what I saw! In this report I gathered the information together to raise awareness of the beautiful, ancient and impressive history of Inishowen. Still visible today, but sadly not always valued for what it is; invaluable ancient historical treasures. 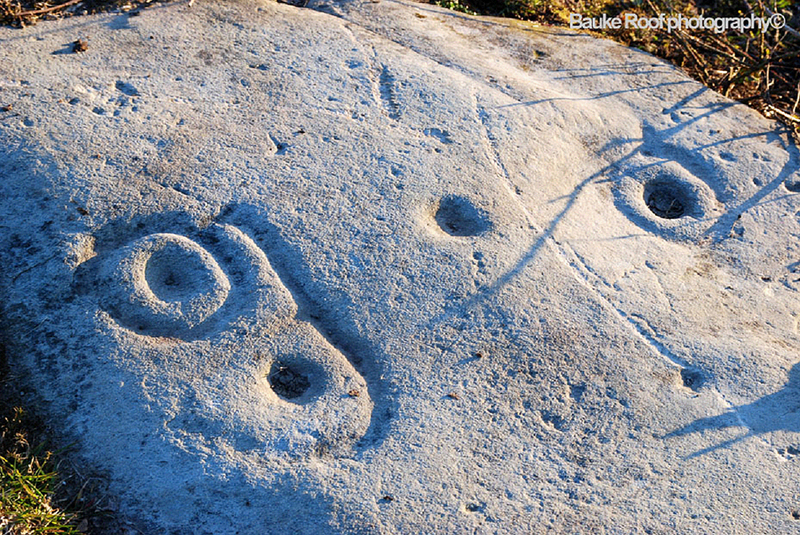 A group of residents from Straths discovered the rocks with the markings on it when a part of the land was cleared to create grazing fields. They contacted Richard Crumlish , Archaeologist (originally from Carndonagh, living in Mayo) to find out more about it. Now, as from 22-4-2013 it is added to the Archaeological Survey of Ireland of the National Monuments Service. Description: Three earth-fast boulders contain various motifs. The largest is at SE and measurers 2.6m NNW – SSE by 1.5m wide. It is carved with four cup-marks and five cup and ring motifs. Two of the cup and ring motifs have external circles and four of the five are connected. The cup-marks measure 0.05m in diameter and the largest cup-and-ring motif measures 0.25m in diameter. The boulder to the WNW of this measures 1.6m N-S by 1.1m in maximum width. It is carved with three cup-marks and three cup-and-ring motifs, two of which are connected. . The cup-marks are between 0.05m and 0.06m in diameter and the largest cup-and-ring motif is 0.18m in diameter. The third boulder is 18m N of the second and measures 2.4m E-W by 0.9m wide. This boulder protrudes from the top of a cliff face. It is carved with two cup-marks which measure 0.06m and 0.08m in diameter respectively. 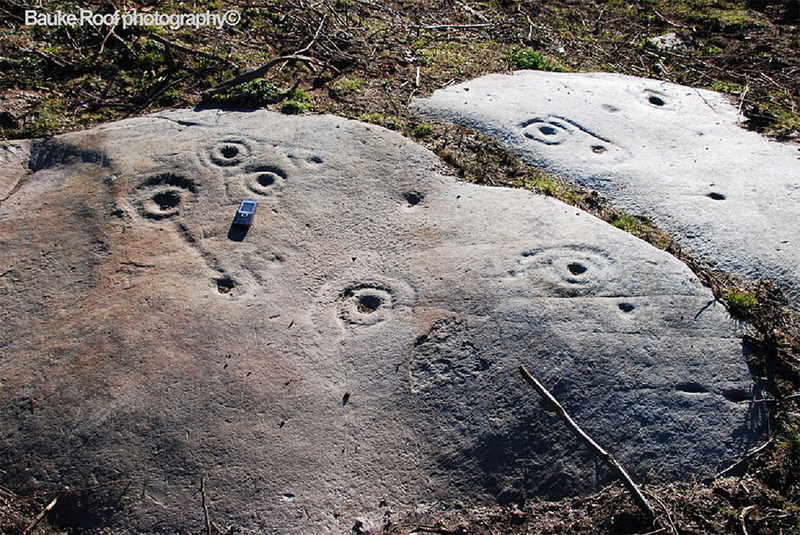 “They consist of a concave depression, no more than a few centimetres across, pecked into a rock surface and often surrounded by concentric circles also etched into the stone. Sometimes a linear channel called a gutter leads out from the middle. “The townland of Carndoagh is a few miles from Carndonagh. It has one major landmark, the twin arch railway bridge constructed in 1901 close to the Carndoagh railway halt. The bridge can be seen from the Carn-Ballyliffin road. In a field nearby there is a rock called Carraig na Spainneach or the Spanish Rock where a Spaniard was hung. West Donegal has several rocks of the same name usually associated with a Spaniard or an incursion. Prior to the Battle of Kinsale and the Flight of the Earls, there are several records to show that Spain sent emissaries – intelligence officers, even spies - to check out the coast line in preparation for an invasion. For example in 1600 two Spanish ships arrived in Teelin with war spoil for O’Neill and O’Donnell. There are many similar references around Killybegs and Slieve League. The only Spanish reference for Inishowen of any significance is the Armada ship La TrinidadValencera in 1588. The question arises as to why this rock got its name. There is a possibility that a Spaniard from the Armada may have strayed here but this is unlikely. Co-indecently, the West Inishowen History & Heritage Group invited Marius Harkin for a talk on the restoration of Carrickabraghy Castle (Isle of Doagh) on the 28th of Feb 2013. There I got in contact with John Hegarty and Bettina Linke who helped me find more information. And I became a member while I was at it. I invited John, Bettina and others up to come see the discovered stones. It was a perfect day when they arrived, the sun was out and low on the horizon. That meant that we could see the carvings a lot better and these circumstances are perfect for photography. There are 3 boulders on the top of the rocky outcrop, one sticks out over the edge. There are small cupmarks on this boulder but there is also a later carving on it of a figure, possibly a saint. It has writing next to the figure but it’s very difficult to make out. Bettina send me a link to the Ulster Journal of Archaeology (Vol. 50 & 51 in 1987 & 1988) called ‘The Prehistoric Rock Art of Co. Donegal’. It is a survey of the rock art in Donegal and Part 1 of his paper is solely dedicated to the rock art on the Isle of Doagh. “The prehistoric rock art of Ireland is primarily found in coastal areas, especially those with deeply penetrating estuaries. 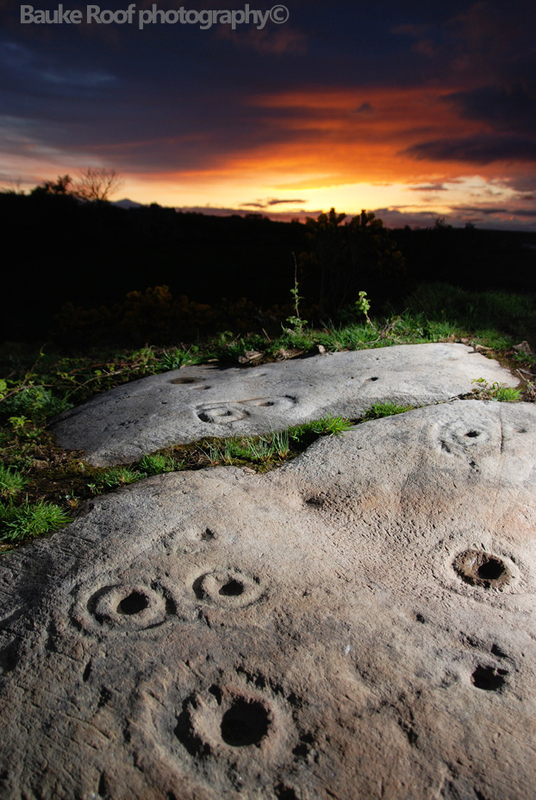 In this respect Co. Donegal must certainly have attracted prehistoric people; and indeed there is much rock art to be found in this county, and as expected, it generally occurs very near the coast. 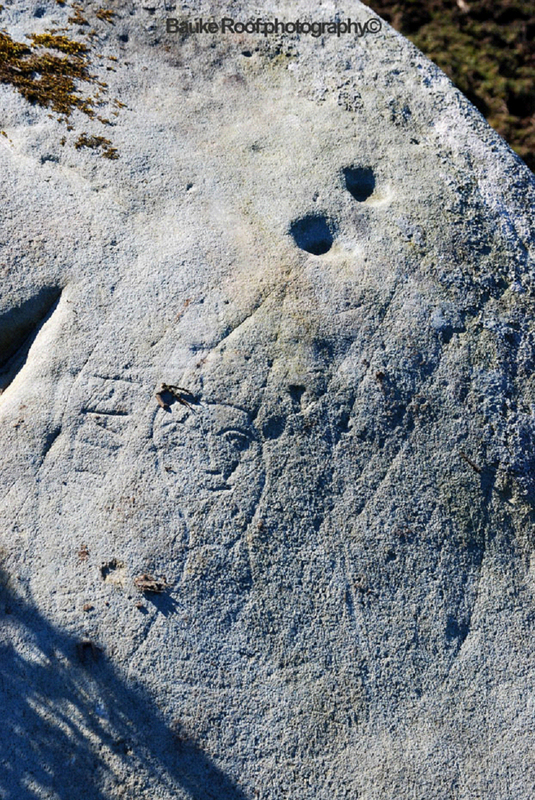 The rock art of Donegal has long been known but has attracted little attention, as most interest has been focused on the Cork-Kerry group of markings and the Passage Tomb art of Co. Meath. Until recently the quantity and quality of known prehistoric rock art in Donegal could not compete with that from other areas of Ireland. But wait!… M.A.M. van Hoek, Oisterwijk Holland………………………..!!!??? This is where I fell of my chair. I’m Dutch, I went to secondary school in Oisterwijk and my Geology teacher was….Mr. Maarten van Hoek! 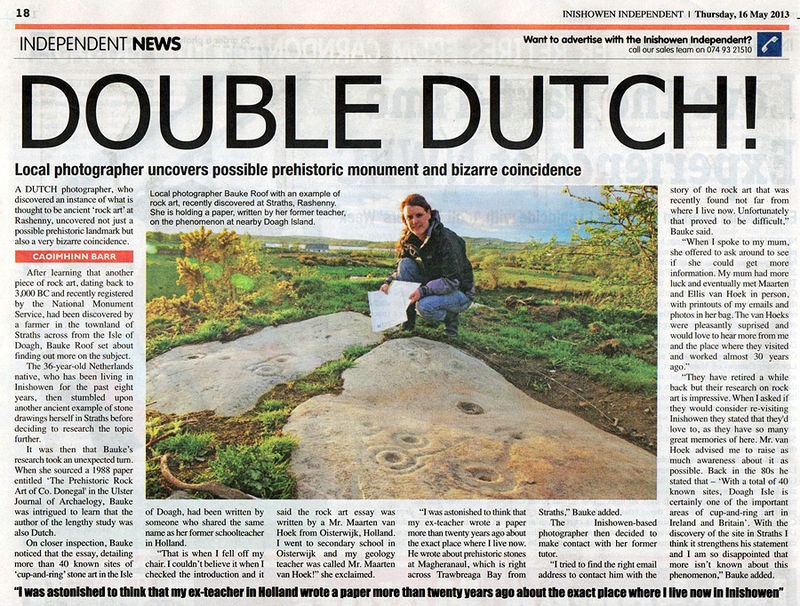 My secondary school geology teacher, Maarten van Hoek, wrote a paper in the Ulster Journal of Archaeology (Vol. 50 & 51 in 1987 & 1988) called ‘The Prehistoric Rock Art of Co. Donegal’.. He described at least 40 sites with marked rocks on the Isle of Doagh, of which at least half (if not more) are in Magheranaul. 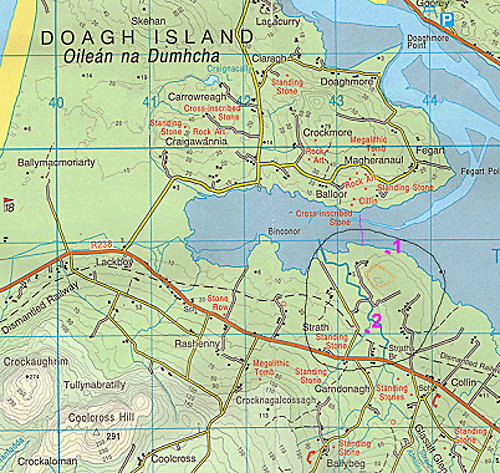 Magheranaul is right across Trawbreaga bay from Straths (See fig 1.; a straight line north from Straths to Magheranaul, in pink) and on a good day you can see the standing stone in the field across the bay on Doagh Island. I tried to find the right email address to contact him with the story of the rock art that was recently found not far from where I live now. 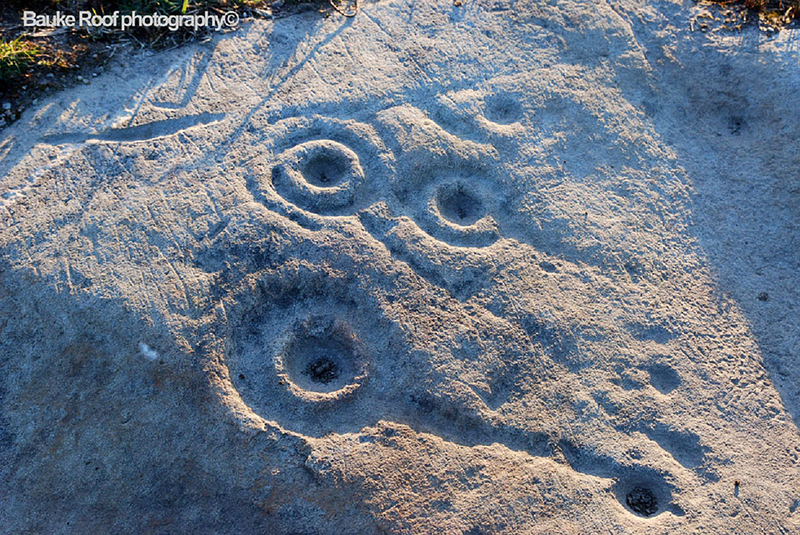 And close to -and in line with the rock art that he (re-)discovered and documented, on Doagh Isle in 1984 to 1986. That was written before Mr. van Hoek taught me geology. Unfortunately, that proved to be difficult. When I spoke to my mum about this striking coincident, she offered to ask around to see if she could get more information. She’s a member of her local heritage group. My mum had more luck and met Maarten & Ellis van Hoek in person, with my emails and photos printed, in her bag. My mum is awesome. The van Hoeks were pleasantly surprised and would love to hear more from me and the place where they visited and worked almost 30 years ago. They have retired a while back but their research on rock art is impressive. They’ve visited, researched, surveyed and written about rock art in Africa, South America and most countries in Europe. I get encouragement, advice, tips and tricks through the emails we exchange. When I asked if they would consider re-visiting Inishowen they stated that they’d loved to, as they have so much great memories of it. However it is unlikely, as they are taking it easy in their retirement and travelling abroad is getting more difficult. With the (re-)discovery of the site in Straths I think it strengthens his statement and I am so disappointed that this is not a well-known fact. given the changes in sea levels in the area is there any likelyhood that there are underwater markings in the stones under the inlet between the two headlands? Not very likely, Eric. Inishowen with the rest of the northern part of the British Islands is still rising as a result of the last Ice Age. Therefore many fields and places here are now higher then they were at the time the rock art was created.